This book is absolutely beautiful. There is really very little I can say other than you need to go pick it up and try it for yourself. 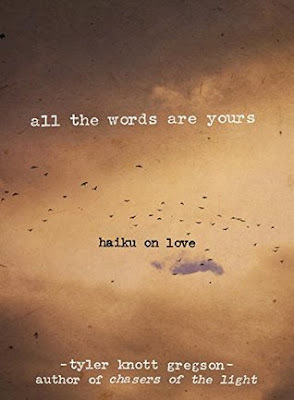 I knew this was a haiku about love when I initially began reading it, and I had already been wanting to read the book Chaser of the Light by the same author because I had heard nothing but wonderful things about it. The format used in this book reminds me of the book Chopsticks by Jessica Anthony because of how the story is told through beautiful photography. In this book, each page includes an artsy photo of a sticky note that parts of the poem have been handwritten on. The style is both unique and works well. As for the words on these sticky notes, they feel very authentic and they even look like a person's natural handwriting. Each one speaks about passion and love in a hopeful and elegant way. There were times where I found it took me a second or two to make out some of the words due to the font style, but this took very little away from the book itself. The poetry in this book was in the form of a haiku and I loved it. I will be totally honest in saying that I am NO poetry expert, and most (more like all) poetry sounds wonderful to me, but nevertheless it was still very well done in this book. I am not sure what type of magic allows for an author to write poetry that sounds so heartfelt and meaningful, yet doesn't feel overdone or cumbersome, but Gregson seems to have done it with ease. Every line is quotable and I kind of want a t-shirt now with all the wonderful lines from this book on it. "All we have endured will make us invincible. From the fire comes strength." And that is only one example out of dozens more. Overall, this is a very short and sweet book that should be great to save for a day where you feel a bit down or blue. Just picking up this book and flipping through a few random pages can transfer kind, hopeful vibes into your system.